This is an exceptionally good case. I was absolutely blown away by how well it is designed and built, and the function is absolutely phenomenal. I have had several Niveus fanless PC’s. They were great cases and had excellent thermo-regulation. The downside to the Niveus was cost – they were thousands of dollars. As they are no longer in production and several years old, I was looking around for a new fanless case. this was the only one I could find that looked like there was even 10 minutes worth of thought put into the design and function. It turns out that this is bar none the best thermo-regulating PC chassis available on the market today. First, look at these numbers- I ran Prime95 stress test on three chassis: The HD-Plex H1.S, another Mini-ITX system with a CPU fan and case fan, and a Dell Precision M4800 laptop (workstation quality laptop). 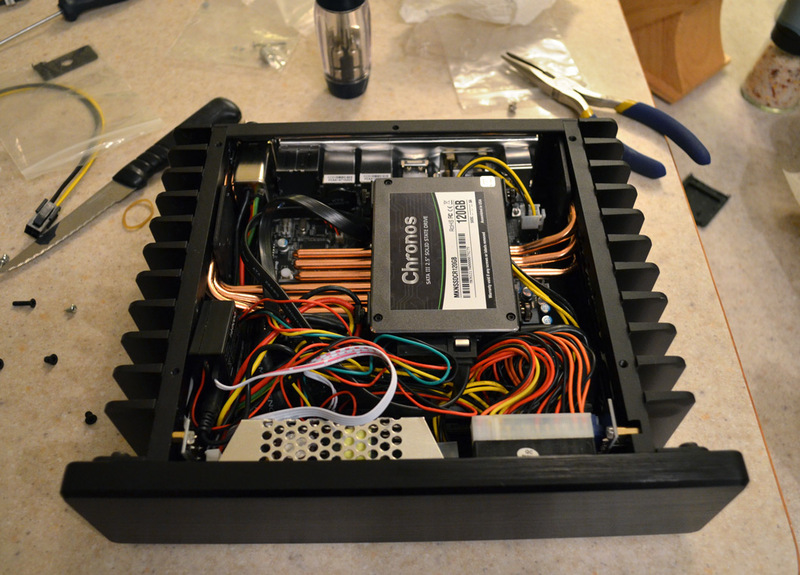 After 5 minutes, the processors in both the Dell and the Mini-ITX chassis were at 180 deg. F. Contrast that with the H1.S which was at only 170 deg. F after nearly 2 HOURS!!!. The ability of this chassis to move heat away from the processor and radiate it from the case fins is clearly superior to a standard CPU fan. 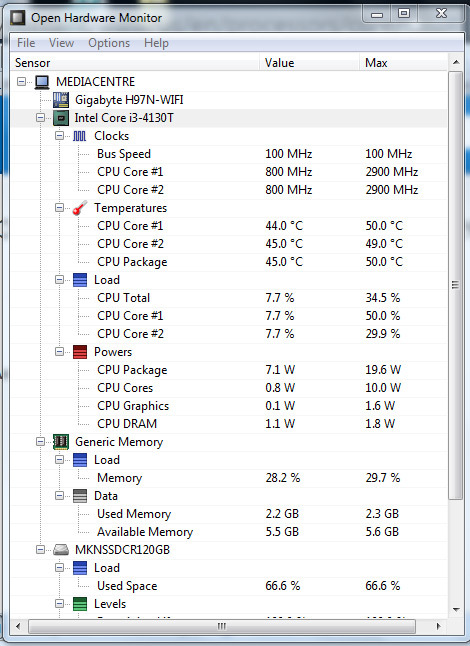 I continued to run Prime95 for nearly 4 hours and the chassis stabilized at around 174 deg. F and never went higher. This amazing thermo-regulation coupled with the fact this the computer was SILENT (no fan noise) really blows me away. 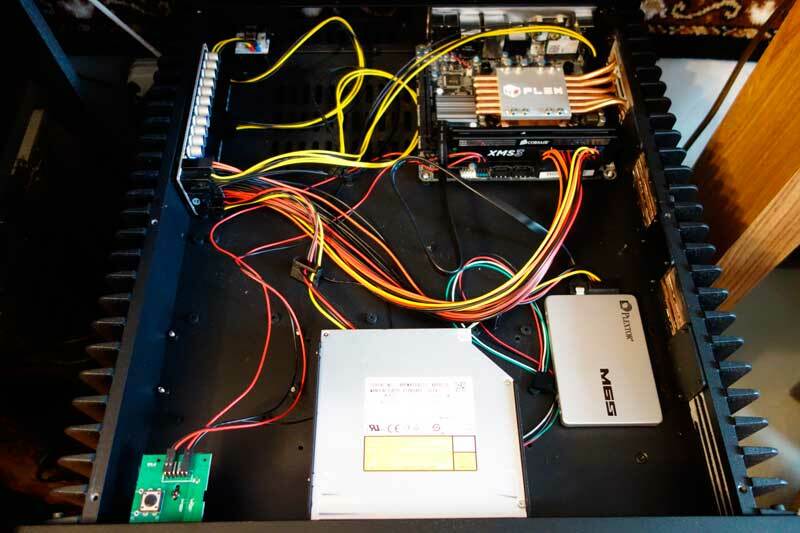 I can not believe that there are not more fanless PC cases being built…This case should be marketed to more than just the high end media server crowd! After seeing these results I am considering switching my every day use desktop to this chassis. Здравствуйте. Вот и я похвастаюсь. Наконец-то все собрал,HDPLEX H10.SODD,i5 4590, gigabyte z97n-wifi, 16gb ram, ssd 256 gb. bd привод еще не подключил, не могу найти переходник питания minisata . В простое температура cpu около 30 градусов, при запуске стресс теста поднимается до 60 градусов. В общем все отлично . Радуюсь полной тишине. Hello. So I brag about. Finally all gathered. 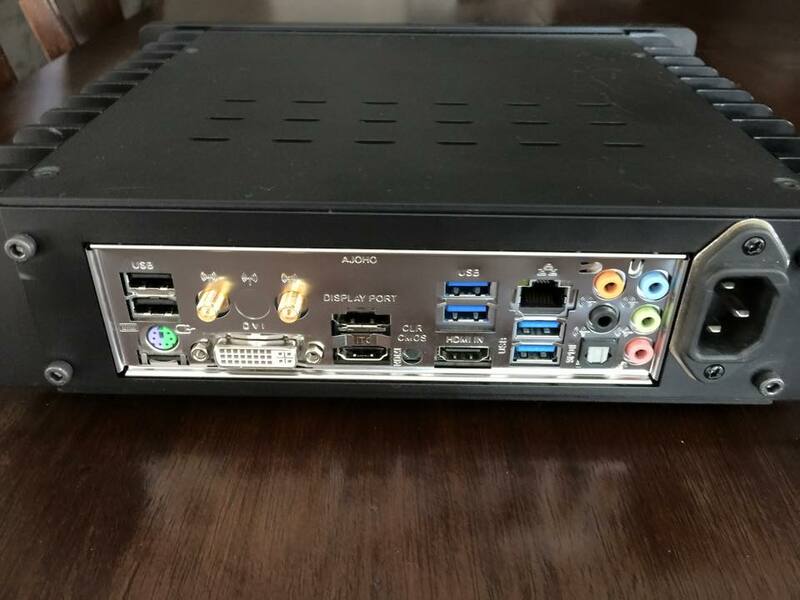 HDPLEX H110.SODD, i5 4590, gigabyte z97n-wifi, 16gb ram, ssd 256 gb. bd drive is not connected yet, I can not find the power adapter minisata. In simple cpu temperature of about 30 degrees, when you run the stress test rises to 60 degrees. In general, everything is fine. Rejoice in complete silence. My newly built PC. No moving parts, small, completely silent and FAST. Fully boots in less than 15 seconds. 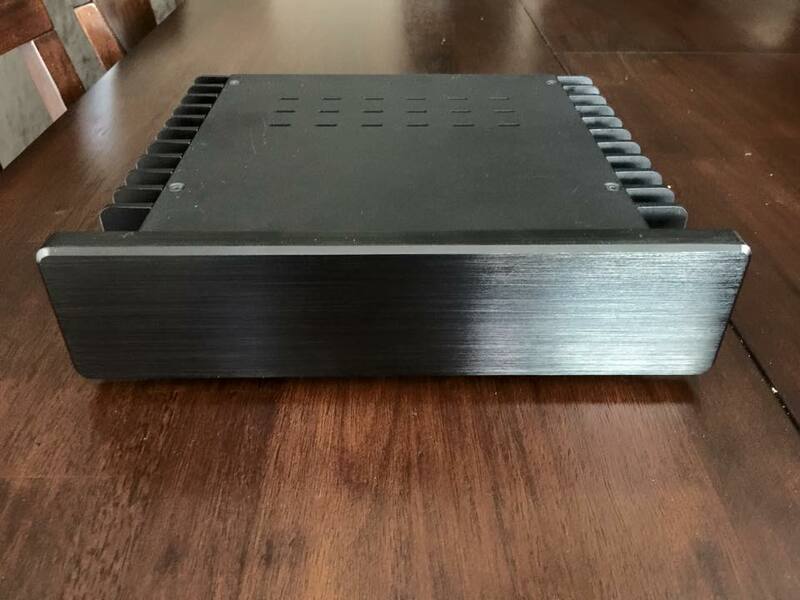 I decided to build a new HTPC. 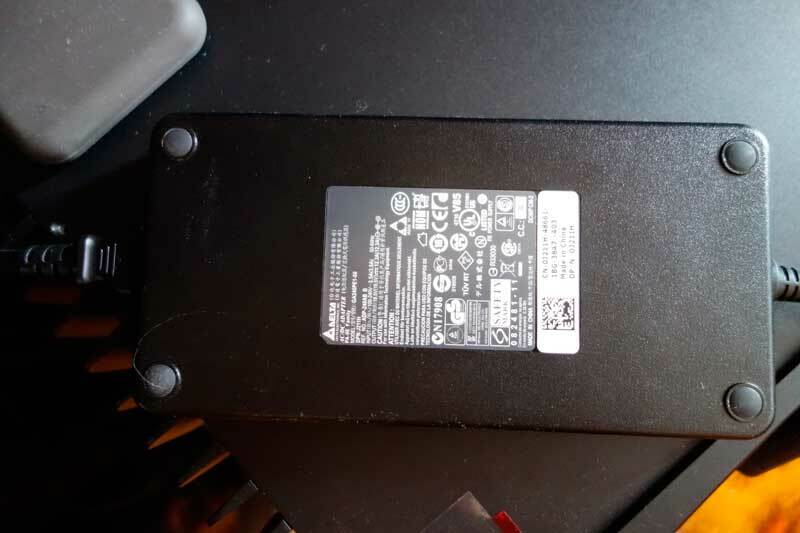 I have been using the Zotac Zbox ID41-U for years as my HTPC which was working great except for the tiny CPU fan that had a high pitch whine that I couldn’t get rid of. I adjusted the fan thresholds in the BIOS which helped a bit, but not enough. 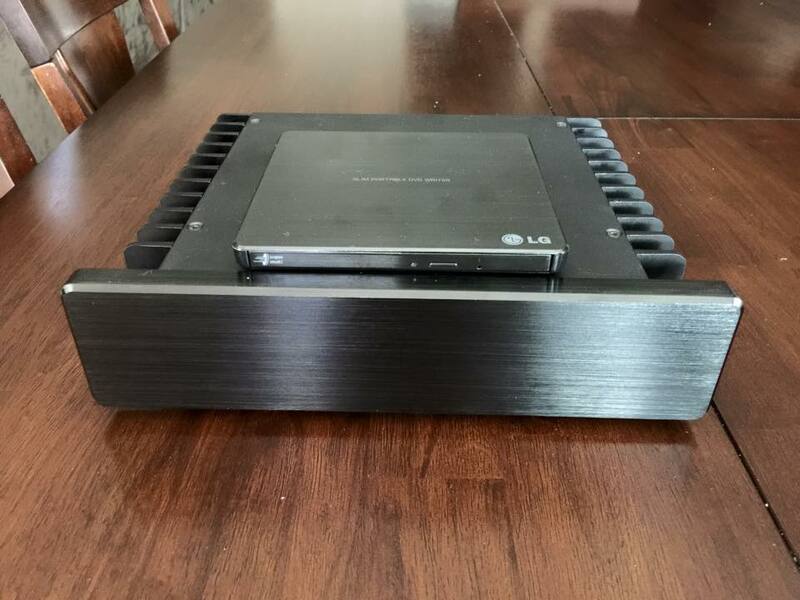 The Zbox was turned on 24/7 so the sound could be grating when it was quiet in the living room. So I decided to seek out a completely silent solution. 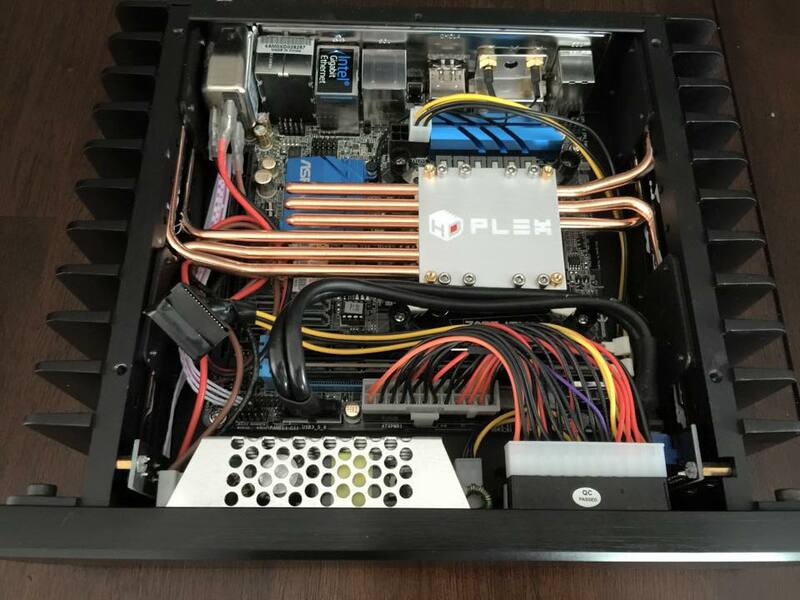 After doing some research I decided on the HDPLEX H1.S – a completely fanless case capable of housing a Mini-ITX or Thin Mini-ITX motherboard. 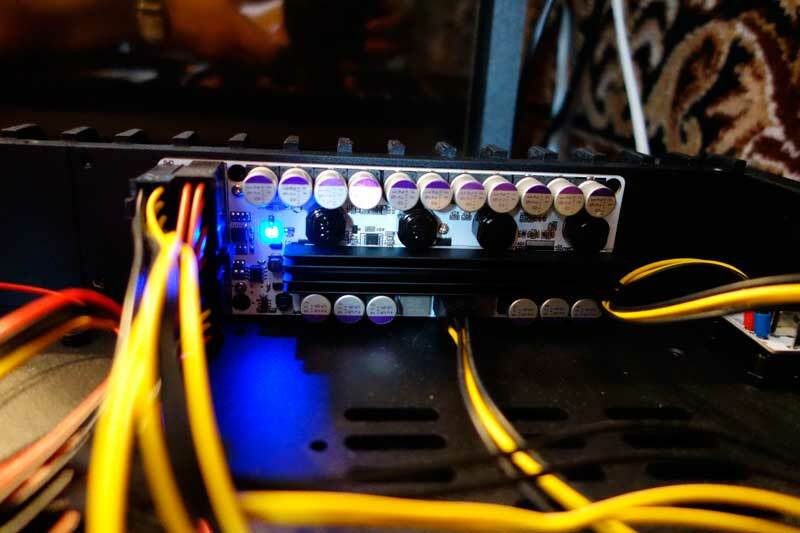 I chose the Gigabyte H97N-Wifi because it has dual ethernet ports so if I retire the box as my HTPC it could make for a very beefy and silent router/UTM. The Intel Core i3-4130T consumes 19W less power than the regular i3 4130 and doesn’t sacrifice much in the way of performance. It will create less heat and with the Intel integrated graphics on the chip it can easily handle 1080p video playback and more. Nice minimal design – no annoying LEDs or obnoxious logos. The customer service from HDPLEX was very good, I would often get a courteous response in a few hours to my support requests. Quality parts – the case is all metal and sturdy. No scratches, blemishes or poor workmanship anywhere to be found. 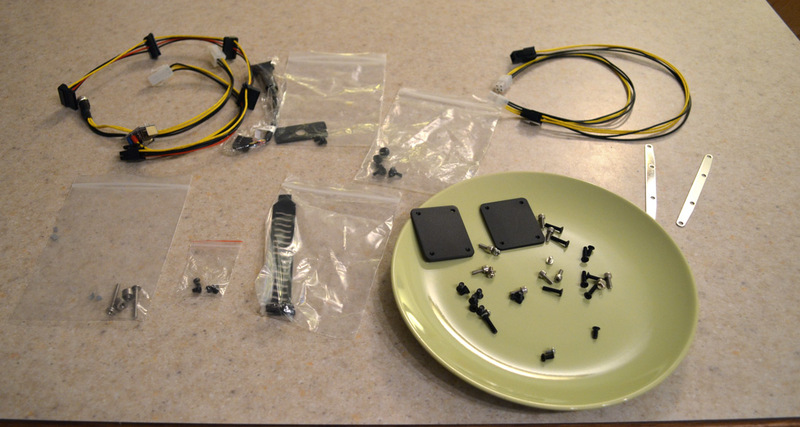 Case comes well packaged with the multitude of screws and other parts in several different zip bags. Each bag appears to be logically separated by assembly step – although I’m just speculating as there was nothing stated in the manual to indicate this was the case. Also included is a velour bag filled with various parts. Comes with an injection tube of thermal paste – enough for the whole project and then some. I was surprised to find a small hex screwdriver included as some of the screws are hex bit. The instructions aren’t detailed enough. The instructions would just say assemble this or assemble that without any details about which of the various included screws or parts to use. There are included pictures, but they are too small or at the wrong angle to help with figuring out the screw types. I’ve built a lot of PCs before so it wasn’t too difficult to figure out. For someone new to building though this might be an exercise in frustration. What didn’t help with the screw confusion was there were a lot of left over parts – for many of them I have no idea what they are for. I was often left wondering if I had used the right screws or not and in some cases I hadn’t, so I had to rearrange them after the fact. Some of the instructions in the installation manual were very vague making for some perplexing head scratching moments. 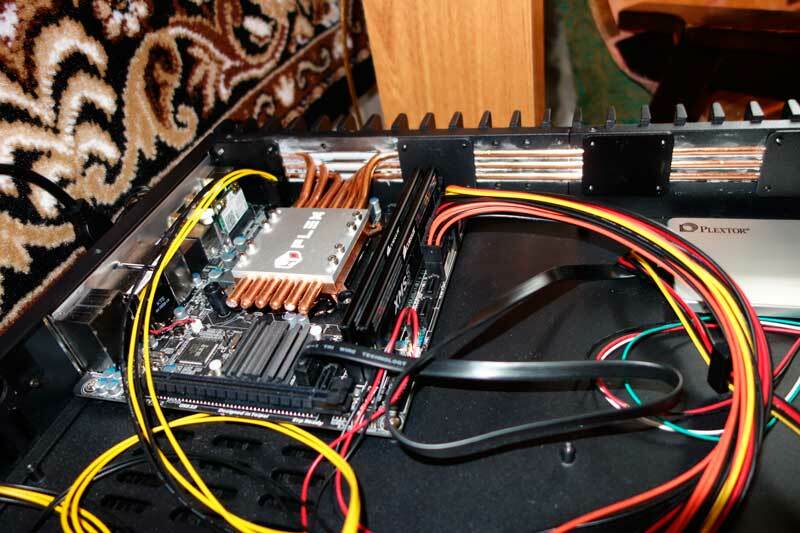 For example on page 5, there is a picture that says, “Use bottom holder to avoid conflict with motherboard components”. I have no idea what that means or what the picture is supposed to indicate. There is an arrow pointing to a bare silver mounting peg(? ), but in the same picture in same type of hole is the standard backplate rubber mounting peg – so which am I supposed to use? There is only this one picture and one sentence that references this peg. I went with the rubber pegs as they had the sticky double sided backing on them for easy installation. 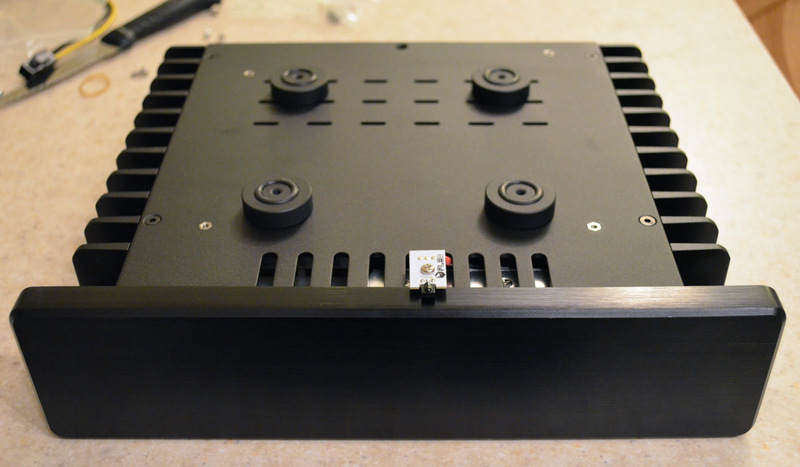 For such a streamlined case, the internal IR receiver stands out as it isn’t tightly integrated into the case. The receiver sticks out of the bottom on a small circuit board. After installation, it interfered with my Microsoft MCE USB IR receiver. I would get double presses or it would seem to steal my remote presses and nothing would happen. So I had to uninstall it, which is not a big deal to me as it might be handy in the future if I use the PC for something else where I want to use the internal IR from HDPLEX and not the USB IR receiver. Also, the screw that came with the IR receiver to mount the chip to the bottom of the case was way too long. When screwed in, it prevented the front plate from being able to attach to the case properly. So it had to be removed and put in as the last step which was a hassle when disassembling and reassembling the case multiple times. If the screw didn’t jut into the body of the case this wouldn’t be a problem. Another instructions annoyance were the directions to spread thermal paste on the side grooves of the case where the CPU heat pipes will contact. The grooves run the entire length of the case sides. The heat pipes from the CPU will only touch one third of the side panels on either side so I ended up wasting a bunch of thermal paste. Luckily, I had just enough left for the CPU plate. Since everything inside the case is so compact, cables and other parts started to get mucked up with the excess thermal paste. I had to use cotton swabs with rubbing alcohol to clean the thermal paste out of the unused groove space. The instructions only tell you after you spread the thermal paste where the heat pipes will actually sit. 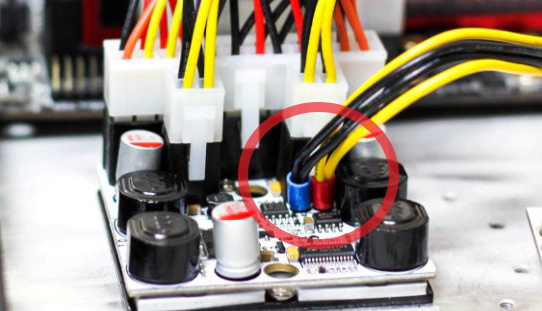 The 4 pin cable for SATA power from the DC-ATX converter didn’t seat properly because the connector’s plastic clip (that holds the connector in securely) would hit against some other cable shielding. For my initial assembly the SATA power cable came loose and my HDD wouldn’t power on, so I had to disassemble, force it in, and clip little bits of the shielding off the other cables to get it to fit correctly. These were all parts supplied by HDPLEX so they should all fit together without modification. I would definitely recommend this case to an experienced case builder. 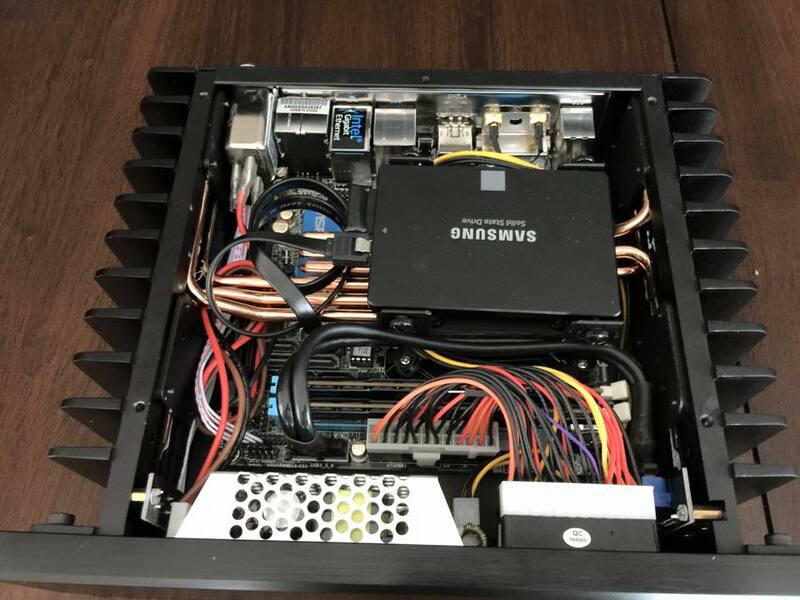 If you’re new to case building I would think twice – it’s not a standard build due to the CPU heat pipe installation and the instructions certainly don’t hand hold you through the process. Once I had it all put together I was very pleased with the aesthetics of the case, the thermal dissipation, and silence.